The first religious ceremony of any faith recorded in Battle Creek was the marriage of Jeremiah McCarthy and Bridget Walsh, which was performed by Fr. Cullen, the resident pastor of Ann Arbor, on July 12, 1847. The first Mass said in Battle Creek was on August 10, 1849, by Fr. Hennessy of Ann Arbor, assistant to Fr. Cullen. From 1855 to 1869, Fr. Frain, Fr. D. Callaert, and Fr. J. Koopmans came from Marshall to say Mass until Fr. William Herwit was appointed as Battle Creek&apos;s first resident pastor in December, 1869. Services were held monthly in Stuart Hall on W. Main Street opposit the City Hall until a little red frame building, formerly used as a church for Quakers, was offered for sale at public auction. On July 1, 1877, Fr. F. J Brogger was appointed as pastor and the work of collecting funds for building actively began. The cornerstone of the parish&apos;s first brick church was laid by the Very Rev. P. Hennaert, V.G., on August 13, 1878. It was dedicated on Thanksgiving Day, November 27, 1879,by Bishop Casper Borgess. So successful was Fr. Brogger&apos;s work that by October, 1880, when he was transferred to Wyandotte, the entire cost of the new structure had been raised. From October 1, 1887, until September 4, 1891, Fr. J.P. McManus was pastor. This good priest, who worked for the welfare of his people had the happiness of knowing that his efforts were much appreciated. He was transferred to St. Stephen in Port Huron, and Fr. 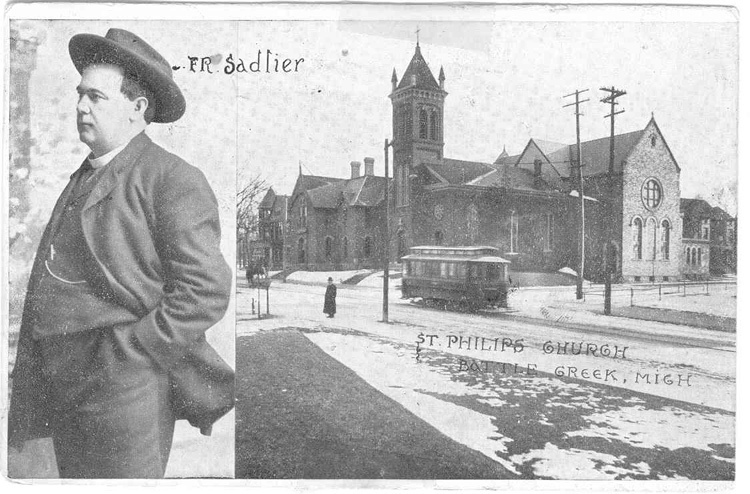 Richard Joseph Sadlier came to St. Philip in 1891. Fr. Sadlier purchased the house and lot next to the school. This was immediately converted into a rectory and in 1905 remodeled and enlarged. Fr. Sadlier died of Bright&apos;s disease, on Feb 14, 1908. The original church burned down in 1928 and in 1929 the present church was constructed. It was built on a design of the late Romanesque architecture and executed in Bedford stone.